Ford's new CEO brings both real and symbolic value to his position. He has been a successful CEO in his own right, especially noted for pioneering the introduction of flexible offices which reflected the adaptive nature of work in Silicon Valley. Although often derided by Scott Adams' "Dilbert" cartoon and others as 'cubicle farms,' they captured the demands of a changing workplace and whose later refinements led to the open office concept that now dominates organizational design across the professional world. Mr. Hackett made his reputation as the head of Steelcase. He built credibility in Silicon Valley for adapting workplaces to fit the needs of computer programmers and other tech workers. Since last year, he has been the head of Ford’s division devoted to autonomous vehicles and new forms of personal mobility like ride-hailing services.One of Mr. Hackett’s first tasks will be change perceptions that Ford is behind not only Tesla and Google but rivals like G.M. Ford Motor was the American automaker savvy enough to avoid bankruptcy when industry sales collapsed during the 2008 financial crisis. Then it rode economic recovery and cheap gasoline to record sales and profits. But what looks like success can turn upside down quickly in Detroit these days. The latest evidence came Monday when Ford ousted its chief executive, Mark Fields, after only three years in the job. Mr. Fields had failed to persuade investors and his own board that the company was moving fast enough to develop the vehicles of the future, like battery-powered cars that drive themselves. Industry stalwarts such as Ford, General Motors and Volkswagen are no longer the only automotive trendsetters. Now they share that distinction with interlopers from the tech world like Google, Apple, Uber and not least Tesla, the electric-car maker now valued more highly than any of the Detroit giants. The upheaval at Ford, the nation’s No. 2 automaker by sales, after G.M., reflects the challenges that lie ahead for companies that cannot adapt to that new landscape fast enough. Mr. Fields, a 28-year veteran of Ford, was a victim of rapidly evolving expectations for carmakers that for decades had been judged on how many vehicles they could manufacture and sell at a profit. And by tapping a new chief executive, Jim Hackett, from outside the ranks of automotive veterans, Ford served notice that it was determined to be a leader in a new era of personal mobility. Mr. Hackett, 62, made his reputation as the head of Steelcase, an office-furniture maker based in Michigan. There, he built credibility in Silicon Valley for adapting workplaces to fit the needs of legions of computer programmers and other tech workers. One of Mr. Hackett’s first tasks will be to demonstrate that progress, and change perceptions that Ford is behind not only Tesla and Google but also traditional rivals like G.M. 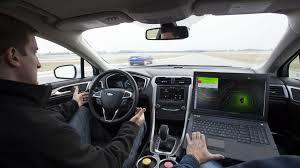 that are testing prototypes of autonomous cars. Mr. Fields, for his part, had been under pressure for months from Ford’s board to sharpen the company’s strategy on future technologies and reverse what had been a 40 percent drop in its stock price since 2014. He also became embroiled in controversy over a $1.6 billion plant the company was planning to build in Mexico to assemble small cars. When President Trump was campaigning for the Republican nomination and criticizing American companies for moving factories to Mexico, Mr. Fields defended the company’s expansion plans there. But once Mr. Trump was elected, Mr. Fields was forced to backtrack, and he ultimately canceled the project. Mr. Ford also felt the need to step in and smooth the testy relationship by speaking directly to Mr. Trump. While it hardly affected Ford’s overall performance, the Mexico episode may have distracted Mr. Fields from corporate issues. And with the American auto market starting to decline after peaking last year, Ford’s profits were also dropping — more than 30 percent in the first quarter alone. By Friday, the company’s directors had had enough, authorizing Mr. Ford to ask Mr. Fields to retire and paving the way for Mr. Hackett’s ascension to the top of the company. Industry analysts viewed the decision as a wake-up call for the company, as well as any other automaker lagging in the high-tech race toward driverless cars. “Given how rapidly the transportation sector is expected to transform in the next decade, Ford can’t afford to be behind the eight ball when it comes to emerging technology,” said Jessica Caldwell, an analyst with the auto-research website Edmunds.com. But it will not be easy. Mr. Ford and Mr. Hackett concede that Ford has been underperforming in some of the core parts of its business, in particular its sales of passenger cars. They also suggested Ford might need to shed some unprofitable business units or drop out of global markets like India, where it is struggling to maintain a foothold — an unwinding similar to the way G.M. is repositioning its business under its chief executive, Mary Barra. Investors reacted favorably to the Ford shake-up, with its shares gaining more than 2 percent on the day and closing at $11.10. But Wall Street analysts said the transformation to a leaner, more tech-focused company could come at a price. “The earnings situation may need to get materially worse before it gets better,” Adam Jonas, a Morgan Stanley analyst, said in a research note on Monday. And even a stronger emphasis on new technology will not immediately close the gap between Ford and its competitors that are developing self-driving equipment. Traditional automakers have focused mostly on lower levels of automated driving where the car handles specific tasks, such as braking and cruise control. Some tech companies, on the other hand, are pushing relentlessly toward higher levels of driverless capability. The best solution for some carmakers may be to align themselves with tech firms to share costs and accelerate development. Auto companies, however, are not yet pursuing full-scale partnerships with Silicon Valley. Instead, they are competing to hire software engineers to develop their own expertise as well as buying start-up firms to augment their research. G.M., for example, spent $1 billion last year to buy the firm Cruise Automation, and Ford recently announced a big investment in an artificial intelligence company called Argo AI. While car companies are reluctant to give up control in the development of any of their vehicles, they may be forced to seek broader, long-term alliances with Silicon Valley on driverless models. “What we may end up seeing is partnerships that could really benefit all players,” Ms. Shaheen said. In Ford’s case, the company has to maintain a fine balance between building quality cars and trucks for consumers in every region of the world and beefing up its commitment to self-driving technology.